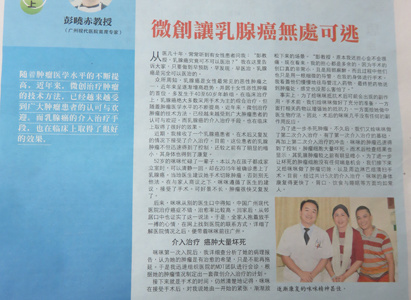 On November 11th, 2015, Guang Ming Daily published a special report, which takes breast cancer patient Mimie’s anticancer experience as example, introduced the efficacy of minimally invasive therapies for breast cancer in detailed. According to Professor Peng, most breast cancer is treated with comprehensive treatment based on surgery. However, with the improvement of medical level, minimally invasive therapy, a new type of anticancer technology has gained widely recognition and praise among cancer patients. Interventional therapy for breast cancer also got good efficacy in clinic. Recently, Professor Peng is treating a Philippine breast cancer patient named Mimie, whose condition is under well controlled after taking interventional therapy. Mimie was diagnosed with breast cancer at the local hospital of Philippine in February, 2015. Doctors in Philippine suggested her to take mastectomy and chemotherapy, but she refused when considering the sufferings of chemotherapy. Then doctors suggested her to take cancer treatment in China, in that Modern Cancer Hospital Guangzhou has advanced minimally invasive therapies. Mimie decided to go abroad and take cancer treatment in China due to her neighborhood’s anticancer experience in China; her neighborhood took treatments in Modern Cancer Hospital Guangzhou and got a good efficacy. On March 17, 2015, MIMIE and her husband came to Modern Cancer Hospital Guangzhou. Professional MDT (Multidisciplinary Team) made a therapeutic plan for her. Mimie took biological natural therapy to improve her immunity, and then took interventional therapy and traditional Chinese medicine to kill cancer cells. After taking treatments in Modern Cancer Hospital Guangzhou, her tumor shrank to 1.03cm quickly without suffering any side effects. In order to prevent the recurrence and metastasis of tumor, Miemie then took resection and lymph node dissection. After taking three sessions of interventional therapy, Mimie’s appetite and sleeping become much better, she recovers quickly and lives a normal life now.